Play Pre-Season BINGO! 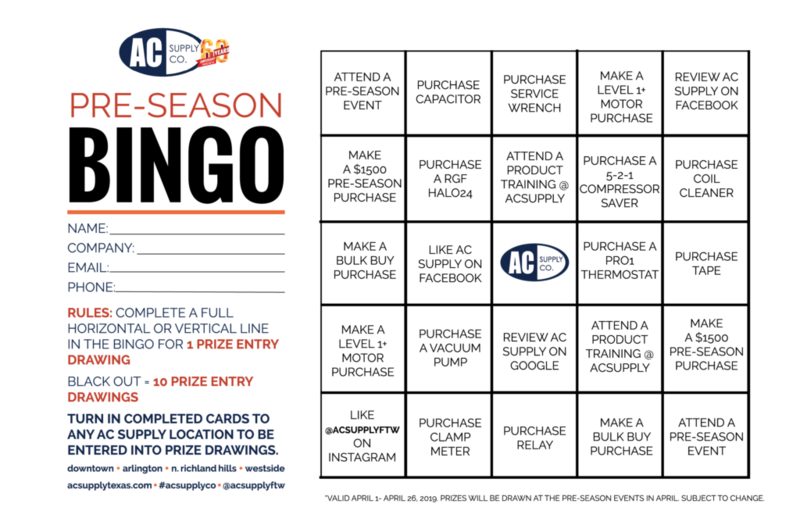 - AC SUPPLY CO.
Home / Promotion / Play Pre-Season BINGO! Throughout the month of April, customers are eligible to participate in our pre-season BINGO game! Mark off Five (5) squares in a row to qualify for a prize entry drawing. Blackout the whole card and we will enter you name to win ten (10) times! Turn in you completed card for verification at any AC Supply Location. Bingo Cards will be available at all stores or you print one off right here.